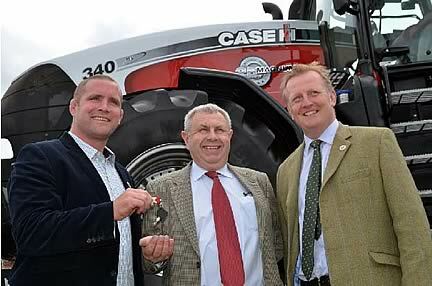 Former England Rugby Captain Phil Vickery presented the keys to the unique Silver Edition Magnum 340 to Bob Vaughan, of Startin Tractors in Warwickshire, whose final bid of £113,500 drew applause from a crowd of more than 900 spectators. Based on the 374hp Magnum 340, flagship of the Magnum range, this special tractor was produced by Case IH to mark 25 years of Magnum evolution at its factory in Racine, Wisconsin. Since the original Magnum was produced there in 1988 this highlyrespected model has been at the forefront of highhorsepower tractor design and continues to set industry standards in terms of its technical innovation, power and performance. The initiative by Case IH will boost the emergency relief fund, which aims to raise £1 million to assist farmers who are struggling. The charity says that the recent difficult weather, combined with the perfect storm of increased costs and disease, has led to some farmers’ incomes falling by more than 50% this year, increasing the pressure on already hardpressed rural charities. It is the brainchild of the Prince of Wales, who has a longheld commitment to supporting Britain’s rural areas.